It was cold, wet and gloomy. “Perfect weather for whisky,” thought Elliot Faber as he walked down Marylebone Road in central London on his way to a private tasting of some of the world’s best Scotch. Faber is the beverage director for some of Hong Kong's hottest gastro-haunts. such as Sunday’s Grocery, Yardbird and Ronin, as well as the founder of Sake Central, and a rising star on this year's Generation T list of young talents. He was in London as a prelude to a whisky voyage through Scotland—a rare opportunity for Faber, whose knowledge of Scotch was, by his own admission, more academic than anything. “The first whisky I had was probably Crown Royal, with my dad,” says the Canadian-born sommelier and sake expert. Though he worked in Scotland for three summers, it was wine and sake that first captured Faber’s heart. When he moved to Hong Kong in 2011, he built up an impressive drinks programme for Yardbird, the plucky izakaya that, after five years, recently moved from Bridges Street to Wing Lok Street in Sheung Wan. That took him on frequent visits to Japan, where he developed a fascination for Japanese whisky. “My knowledge of whisky came in a kind of backwards way,” he says. Whisky was brought to Japan by Masataka Taketsuru, a chemist who travelled to Scotland to learn the centuries-old art of distilling. Though Japanese whisky is based on the same production techniques as Scotch, it tends to have a more mellow flavour because of Japan’s notoriously soft water and warmer climate. Having visited some of Japan’s most acclaimed distilleries, Faber was curious to explore their roots. “I’m kind of a nerd about process and how whisky is made,” he says. But first there was the tasting on Marylebone Road. There was a Lagavulin 12, new releases from Port Ellen and Brora—two “lost” distilleries that have recently been revived after decades of being shuttered—and the star of the night, a Port Dundas grain whisky distilled in 1964 and aged for 52 years. Faber jotted down tasting notes on his phone. “Structure and restraint,” he wrote of the Port Ellen. The Lagavulin was “too youthful". A day later, Faber boarded a flight to Inverness, where he set out for Glen Ord, a 179-year-old distillery that makes whisky for the Singleton series of single malts. “The weather was terrible but the air was clean and sweet,” he recalls. As it’s one of the more popular distilleries to visit in Scotland, the experience at Glen Ord was not exactly intimate, but Faber was still able to glean some interesting information, like how the distillery uses washback tanks made of Douglas fir imported from the west coast of the United States. Things got more exciting as Faber drove west to the Isle of Skye. After stopping for a moment to admire the 13th-century castle at Eilean Donan, he ventured across to the island and made his way to its only distillery, one that makes some of his favourite whisky. Nestled between rolling green hills and a shallow inlet, Talisker Distillery is a collection of whitewashed, pitched-roof buildings that has grown bit by bit since 1830. Its whisky, known for bold flavours with a delicate finish, has won many admirers through the years, among them Robert Louis Stevenson, who referred to Talisker in a poem as “the king o’ drinks". The distillery tour was a fascinating experience. 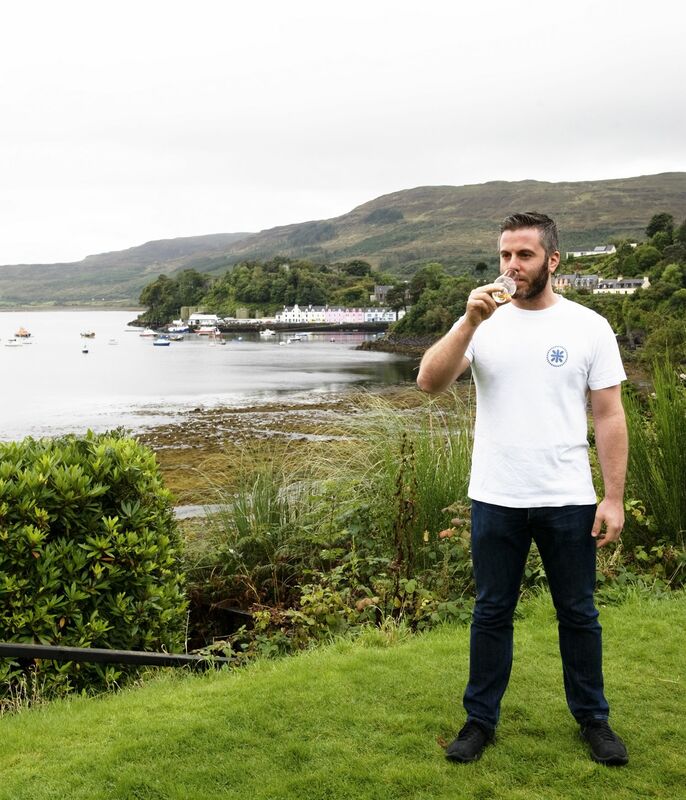 "When I go to a Japanese distillery, there’s always a language barrier, but Talisker could answer anything as in-depth as I wanted,” says Faber. "When you go to a distillery you never stop learning." He was particularly taken by the swan neck lye pipes that plunge into a bath of cold water, which cools and condenses vapour from the stills. “It’s what gives Talisker a peppery taste, but they can’t explain why,” he says. “It’s the kind of thing that captures the myth of whisky.” Although the distillery produces 3.5 million litres of spirit per year, it’s not exactly an industrial product, since it owes so much of its character to intangible forces like climate, water and mysterious swan neck pipes. After the cooperage and a visit to Cardhu, which makes a large part of the whisky blended to create Johnnie Walker, Faber ended up at the Highlander Inn, a legendary whisky bar in the small town of Craigellachie. There he met the inn’s owner, Tatsuya Minagawa, who poured him some rare Scotch and even rarer Japanese whisky.